Daily planners help you plan your priorities with a daily two page spread. They are half of the thickness of the 12-month dated planner, don’t have goal or life planning pages, monthly, quarterly and yearly planners or reviews. They are designed specifically for planning your daily to-do lists, phone calls, follow-ups, notes etc. What is the difference between Make Your Mark notebook, daily planner and journal? Let’s start with common features: all three products have been inspired by the Leaders in Heels Manifesto promoting key traits of female leaders: passion, creativity, innovation, confidence, determination and kindness. Each product has six structured sections focusing on one leadership trait at a time. The notebook has a lot of free writing space. Every page has an inspirational quote or thought. It is perfect for meetings, the boardroom or journaling in your free time. It is also frequently given as a welcome gift at workshops, conferences or coaching sessions. The journal is like a workbook, I would call it a business, career and life coach rolled into an elegant and compact book. It includes a lot of exercises and assignments like passion discovery exercises, ideal day visualisation exercise, goal setting pages, a bucket list, activities to determine your core values, strength discovery exercises, confidence tips, an achievements diary, a guide to creating your own pitch, hacking your own work and life habits, productivity tips, determination and bad day building plan, kindness, mindfulness & gratitude assignments. The journal has also 20 blank pages for notes. The journal makes a perfect farewell gift to take home after a coaching session or a leadership workshop or conference. Together the Make Your Mark notebook and journal create a perfect coaching duo. The daily planner is designed to sit on your desk and help you plan your day. It is designed with a space for top priorities, two to-do lists (separate for top and secondary priorities), rewards and other notes and thoughts such as a review of the day or gratitude notes. WILL YOU RESTOCK THE PHENOMENAL WOMAN PLANNER? Unfortunately the Phenomenal Woman planners won’t be reprinted again soon. But we have 5 cover choices in just launched Make it Happen collection. The main difference is that the focus of the Phenomenal Woman planner is celebrating women, with weekly quotes from incredible women, while the Make It Happen planner (and collection) focuses on productivity, persistence, determination, and getting things done. The Phenomenal Woman planner will have weekly inspirational quotes from extraordinary women such as Maya Angelou, J.K Rowling, Amelia Earhart, Coco Chanel, Madonna, Brené Brown, Tory Burch, Estée Lauder, Beyoncé, Martha Stewart, Gloria Steinem, Eleanor Roosevelt, Erica Jong and many more amazing women who are leaders in many different aspects of life. The quotes focus on confidence, resilience, courage, success, persistence, happiness, wellbeing, and more! The Make It Happen planner will have weekly inspirational quotes from thinkers, doers and leaders (both male and female) such as Jim Rohn, Dale Carnegie, Arianna Huffington, Oprah Winfrey, Sheryl Sandberg, Henry Ford, Hillary Clinton, Amelia Earhart, Beyoncé, Tony Robbins, Walt Disney and many more amazing leaders who made things happen. The quotes focus on persistence, determination, confidence, resilience, courage, and all the qualities you need to make your dreams happen! Please visit our Monogramming FAQ page. We ship to 47 international destinations including USA, Canada, UK, New Zealand, some European and Asian countries. The easiest way to check if your country is on the list is to add a random product to your cart and see if you are able check out. Shipping cost is $9.95 worldwide. Currently, we also offer free worldwide shipping over $80. We reserve the right to change it any time. During pre-Christmas season we also offer express shipping. Express shipping cost is quoted during checkout and depends on weight. All physical goods are shipped on Mondays. In the days leading up to Christmas we will be shipping daily! Standard delivery times (free shipping and flat rate shipping) are 2-6 business days from the shipping day within Australia, 3-15 business days from the shipping day internationally. We can make an exception and ship within one day if you need your order urgently, such as for an event. Please note this is an exception, however! For international orders, the delivery time may take longer than the allotted 15 working days if your shipment is delayed by customs. However, this is very rare, and is outside our control. Please ensure you take this into account when placing your order and add additional 1 week before contacting us. In the lead up to Christmas we might allow express shipping option for certain destinations. Express Shipping takes 2-3 days to arrive for Australian and New Zealand orders, and 4-7 days for all other international destinations. If the option is not available during checkout, it means express shipping is not available. If you need something shipped express please contact us. Please go to TRACKING & RECEIVING YOUR ORDER section below to read more about how to track your order and how to estimate the delivery times for your destination. All downloadable products (ebooks and digital prints) are delivered instantly after the purchase is made. Please check your junk folder. What is the cut-off date for Christmas orders? In the days leading up to Christmas we will be shipping daily! December 21, 2018 (Friday) – LEADERS IN HEELS closes for 2018! Any orders placed on or after December 21, 2018 will be shipped after Christmas. January 3, 2019 (Thursday) – LEADERS IN HEELS opens in the new year. We will respond to any enquiries received over the Christmas break as quickly as possible. All orders ship from our studio in Balmain, NSW, Australia. How can I receive an order confirmation/tracking number? All our customers receive notifications of order confirmation when the order is paid and tracking number when the order is shipped. If you haven’t received it please check your junk email. Please search for “Leaders in Heels”. If you cannot find it, please email us and we will resend it then. Please note you cannot receive your tracking number unless your order has been shipped. For that reason you will receive tracking number not earlier than 1-6 days after your order has been placed or 3-7 days if you ordered monogrammed items. We ship our parcels primarily through Sendle or AusPost. The couriers that will make the delivery are Couriers Please, Fastway or AusPost. For all orders over 500 grams signature on delivery is required unless advised otherwise in the order notes. Very remote parcels, po boxes and parcel lockers are delivered via AusPost. Signature on delivery is required unless advised otherwise in the order notes. If authority to leave has been given and the courier tracking dashboard says it has been delivered we cannot take responsibility for the delivery. All orders are shipped from Balmain/Sydney/Postcode 2041. If you are concerned about your delivery please contact the relevant courier/AusPost first and quote your tracking number. If you attempted to contact Couriers Please or Fastway but without any luck please direct all your queries to [email protected] as they will be the quickest to help out. Your order is arranged by AusPost or DHL and delivered via postal service i.e. it is handled by your local post office. You will receive a notification of tracking number when the order is shipped. The tracking link you receive will most likely have detailed updates until your parcel reaches your country. After that for more detailed tracking events your parcel can be tracked on your local postal service tracking site using Tracking ID. For AusPost shipments the Tracking ID is the same as in the original link we provided to you. For DHL shipments you can find the Tracking ID on DHL tracking page in the top right corner (the number that starts with LX, LW, EP etc…). For your convenience we listed tracking pages from the most common destinations we ship to. Simply copy and paste the tracking ID to see the tracking of your parcel. The estimated transit time for international orders is up to 15 working days however during busy Christmas period there may be delays or inconsistencies with tracking and/or your parcel might be delayed by custom clearance. If you ordered monogramming it delays your delivery further by 3 days. For that reason we suggest you wait 4 weeks before contacting us. As a First step please click the link to track your package on the postal site. Second step, please visit or call your local postal service. Third step, contact us to start an investigation once the time period has elapsed (4 weeks) and you have followed the prior 2 steps without success. If the parcel is returned to us due to wrong address or no-one available to sign on delivery and no attempt to pick up the parcel from the post office or depot has been made in timely manner we cannot take responsibility for the redelivery. If you did not select the transit insurance option during checkout, we cannot take responsibility for any damaged or missing deliveries. My tracking dashboard says my order has been delivered but I haven’t received it. Please wait 2-3 days before contacting anyone. We had many cases like this. Your parcel is most likely in a truck with the driver and will be delivered soon. Please follow the steps above to investigate your parcel. I still haven’t received my order for (physical products). Where is my notebook/planner/journal? All physical goods are shipped on Mondays and delivery times are 2-6 business days from the shipping day within Australia, and 3-15 business days from the shipping day internationally. In the days leading up to Christmas we will be shipping daily! Please be patient if your order hasn’t arrived and the estimated delivery times have not been exceeded. For international orders delivery time may occur past the allotted 15 working days if delayed by customs – this is very rare, and is outside our control. So please add an additional 7 days to the estimate before contacting us. Business days are defined as Monday to Friday, excluding holidays. I still haven’t received my order (digital products such as ebooks/digital prints). Digital products are sent immediately after the order is made and paid. After the payment has been processed you will receive an email with a link to the pdf file(s). If it’s been more than 10 minutes and you still haven’t received an order confirmation, please check your junk/spam folder, and the Promotions tab in Gmail. You can also search for an email containing the title “Your Leaders in Heels order”. If you still can’t find it please contact us directly and we will resend the order confirmation. If you purchased both physical and digital products in one order, you will receive an ‘order completed’ confirmation once we pack and ship the physical products, which is done every Monday. For those with Hotmail accounts, please note that the service has many issues as it is no longer supported by Microsoft. Unfortunately, there isn’t much we can do for email delivery issues to Hotmail addresses and you may experience delays in receiving your order. If you have already placed your order, contact us and we will find a way to send the products to you. We are confident you will love our products! So if you are unhappy with them for some reason, you can return your order for a full refund (including shipping costs you paid when you purchased the item) within 60 days from the purchase date. The offer to refund the outbound shipping costs refers to economy shipping option only. There are some fair limitations to our Love it Guarantee promise. Our Love It Guarantee is designed to allow our online customers to see and touch our products, similar to a physical store, without taking any risks. It is also to protect our customers against manufacturing defects. To qualify for the guarantee, the product must be unused and in their original packaging, in a shipping-appropriate cardboard box to ensure it arrives at our studio in mint condition. Note that it is your responsibility to read the product description carefully to ensure you are aware of what you are purchasing. Unless your product arrived damaged or has manufacturing defects, it is your responsibility to pay for the return shipping. We will, however, refund you in full once the item has been returned in mint condition – including the outbound shipping fee you paid when you purchased the item. We may also ask you to answer some questions to help us improve your products in the future. In the rare case where your item arrived damaged, or has manufacturing defects, we are extremely sorry! Please email us photos of your purchase so we can share these with our factory or courier to further improve our services. We will work together with you to resolve this issue. We encourage you to read the product description carefully and check the images on our website before ordering – for international customers especially, the return shipping costs to Australia can be pricy. Please note some countries charge local customs fees or VAT for orders arriving from overseas. LEADERS IN HEELS does not accept any responsibility for customs delays, duties or taxes that may apply in destination country. LEADERS IN HEELS recommends international customers to contact their local Customs Office in regard to any potential duty you may be liable for. By confirming a purchase you are accepting responsibility for all customs charges incurred as LEADERS IN HEELS will not refund customers who incur any such charges. Can I buy one of your products as a gift and send it directly to my (friend, daughter, mum, colleague, boss, mentor, etc.)? Yes, you can. You can provide different billing and delivery addresses and add any special instructions in the ‘Notes’ section while making an order. Please note, due to fraud protection financial institutions may not allow shipping country to be different to the country of the credit card payer. In this case you might not be able to complete the transaction. Typically we wrap orders in red tissue paper and include Manifesto and/or Thank You message. However during very busy periods such as pre-Christmas we might not have resources to wrap all orders in tissue therefore your order will include Manifesto and/or Thank you card. It will also come in our custom-branded packing box that is designed to inspire the recipient. Please note the tissue paper is delicate and you may want to consider re-wrapping your order in gift wrapping. As we have no control over how the shipping company handles the parcel, we cannot guarantee the condition of the tissue paper wrap on delivery. I’m organising an event for women (a retreat, a workshop etc). Do you think the Make Your Mark products would make a good gift for attendees? 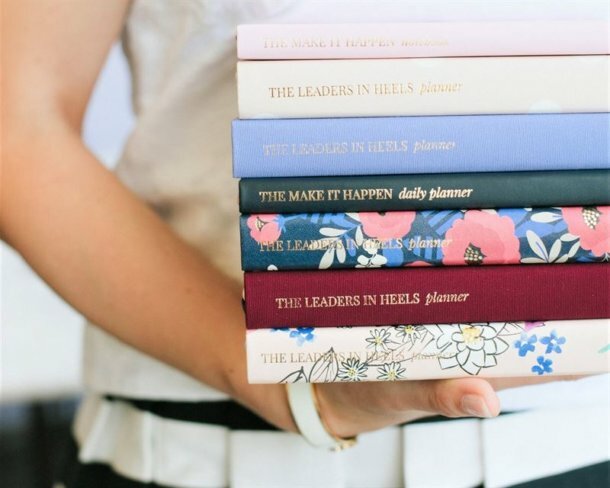 The Leaders in Heels stationery has been designed to make a perfect gift for employee reward and engagement, as a tool during professional development workshops, conferences, retreats and one-on-one coaching sessions. In fact, this is where we sell majority our products. Read more about the Corporate Orders. All samples must be purchased at RRP. A full rebate will be provided when you place your corporate order. Our corporate discounts start from AU$400/US$300. Please contact us for detailed discount structure. Yes, we do, please read more here about our wholesale offer. Ooops, I have been slow and my link to download the digital product expired. What can I do? All downloadable products have an expiry date to protect us from online theft. Please contact us and we will extend the expiry date so that you can download your products. Printable products are PDF’s that are ready to print at home or with a printer. PDF’s can be opened using free Adobe Reader software. What is the largest size I can print my file in? This varies depending on the file – all files come with a maximum print size, and most of our prints are designed to be printed at the highest possible resolution. Some of them go all the way up to A1 size! Designs printed on A5 suit frames with an image area of 5″x7″. Will also suit 6″x8″ frame without white mount. Designs printed on A4 suit frames with an image area of 8″x 10″ (20cm x25cm) or 8.5″ x 11″ (21cm x 28cm) or A4 (21cm x 29.7cm). Will also suit A4 frame without white mount. Designs printed on A3 suit frames with an image area of 11″x 14″ (28cm x 34cm) or 12″ x 16″ (30cm x 40cm) or A3 (29.7cm x 42cm). Will also suit A3 (29.7cm x 42cm) frame without mount. The standard rule is that prints can be resized for printing on a smaller paper size. For example, A1 can be easily resized and printed on A2 to A6 size with the same sharpness and clarity. However, printing a larger size than the maximum recommended will mean your print comes out blurry. Many of our prints will also come with a square version where you can still print them on a standard size paper in your home office and you will have scissor lines on your print where to cut your print to make it perfectly square. How do I print your planner inserts? You can print the pages directly to A5 paper, but the inserts have also been designed to be printed on standard A4 paper, which is then cut in half to get the A5 size. This means you can print them on any standard printer in your home or office. The layout has also been designed so the pages are printed out in a booklet style (hello easy printing!). It means that the first page will be the one on the right side of your open planner, the second page is the left side when you flip the page, and so on. Pages 2 and 3: These are usually the main inserts you purchased, designed as a two-page spread. For example, a weekly spread with Mon-Wed on the left page and Thurs-Sun on the right page, or goal setting pages structured across two pages. However, note that some pages, such as meeting notes, will only take up one page. Page 4: The back page, which is usually a space for general note-taking, doodling, brainstorming, or whatever else you want to do! The planner inserts are designed so you can print one cover page, multiple copies of the main inserts, and a back cover. No paper is wasted! Most printers have similar settings—these are the setting that have worked for us. To print multiples of the main inserts, choose to enter the page numbers to be printed. Then enter 1, 2, 3, 2, 3, (repeating 2, 3 for as many insert pages as you want), 4. For example, “1, 2, 3, 2, 3, 2, 3, 4”will give you one cover, 3x double spreads of the main inserts, and a back cover. And it only takes up two sheets of A4 paper! Punch the holes to fit your planner. Put your pages into your planner, and enjoy! Found an even better way of printing the planner pages? Let us know and we’ll add your ideas to our FAQ! My national currency is Hong Kong dollars, EUR or whatever. Can I still shop in your online store? Yes, our store uses geo-location to select your preferred currency. If your local currency is not available in our store it will default to USD. At the checkout your bank will simply convert your order at the current spot rate between USD and your national currency. Why am I asked to pay additional fees to pick up my parcel from my local post office? Some countries might require you to pay import taxes/customs charges or GST/VAT. LEADERS IN HEELS does not accept any responsibility for customs duties or taxes that may apply in destination country. How should I use the Phenomenal Woman Planner? Refer to this guide to learn how to get the most of your Phenomenal Woman Planner. How should I use the Make It Happen Planner? Refer to this guide to learn how to get the most of your Make It Happen Planner. How should I use the Make Your Mark set? Refer to this guide to learn how to get the most of your Make Your Mark Set. Normally it is simply a case of adding ” leadersinheels.com ” as an email address to your Contact list and/or Address book. Once you have leadersinheels.com registered as a genuine contact, rarely would the email client consider any correspondence from us as spam. Please note that it is possible that not all emails from leadersinheels.com will be delivered to your inbox, there may be cases where it is delivered to your bulk/junk mail folders. Please ensure that you check them regularly to ensure that you do not miss any emails from leadersinheels.com.